As previewed early this year at CES, Mushkin is now launching their first SSDs using 3D NAND flash. 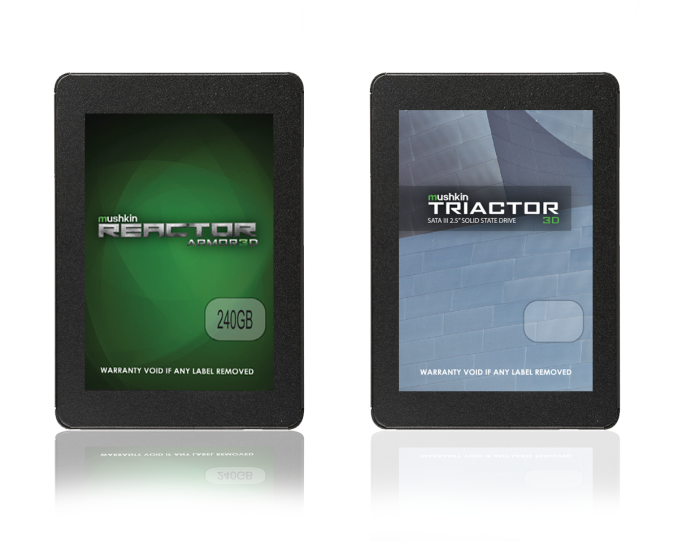 The new Reactor ARMOR3D is the replacement for the successful Mushkin Reactor, which held on to its position as one of the most aggressively priced MLC SATA SSDs as the mainstream segment of the market migrated almost entirely to using TLC NAND flash. The value-oriented Mushkin Triactor hasn't been around for quite as long as the Reactor but it too is being upgraded, to use 3D TLC NAND. The new Mushkin drives continue the pattern of using Silicon Motion SSD controllers, with both new models incorporating the current SM2258 controller. The 3D MLC and 3D TLC NAND comes from Micron, the first flash manufacturer to provide 3D NAND in volume for independent drive manufacturers (Samsung has largely been keeping their 3D NAND for their own SSDs, and the rest are still ramping up production capacity). Both models use the first-generation 32-layer 3D floating gate NAND flash, not the upcoming 64-layer 3D NAND. The major hardware components of the new Mushkin SSDs make them broadly similar to the ADATA SU800, SU900 and XPG SX950 SATA SSDs, all based on the SM2258 controller and Micron 3D NAND. There may be minor firmware differences between ADATA and Mushkin's offerings and they don't exactly match on overprovisioning ratios and usable capacity, but performance should be broadly similar between drives using the same NAND and similar capacity. Mushkin has not announced MSRPs, but the usual online retailers should have these drives in stock soon with competitive pricing. Mushkin is initially offering a narrower range of capacities than ADATA, with 240–960GB for the Reactor ARMOR3D, and 512GB and 1TB for the Triactor 3D. Larger capacities are likely to be introduced when NAND prices get back down to reasonable levels, but that may not happen until it's time to move to 64-layer 3D NAND. Mushkin is offering three-year warranties on both new models. ADATA's 3D MLC SATA SSDs come with five and six year warranties, so Mushkin will have to beat them on price. Mushkin also has their first NVMe SSD in the pipeline. The upcoming Mushkin Helix will pair the Silicon Motion SM2260 controller with Micron 3D MLC NAND, and like these new SATA drives its closest competition will be another ADATA drive, the ADATA SX8000. SATA drives will still be important for the foreseeable future. Heck, in the future high end systems may use a cheaper SATA SSD for mass storage in place of a HDD. You'll have an NVMe M.2 (or PCIe expansion card) SSD for your main drive, and a slower SATA SSD for secondary storage. Yes the speed boost might be a benefit, but to me the main advantages are higher reliability and zero noise/vibration vs a mechanical drive. Good for silent systems. Although suspended (or otherwise heavily decoupled from the chassis) HDDs are pretty darn quiet even under load. It likely comes down to SLC cache trickery. So they go to 3d nand, but dont bother going above 1TB?